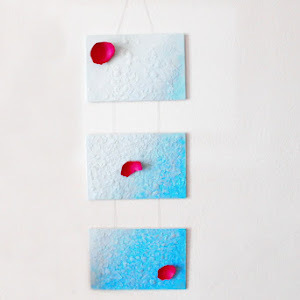 I'm so excited to share this DIY art tutorial with you. Creating of this abstract painting is very messy, but also very fun. It's so fun that is hard to stop making all those lines. 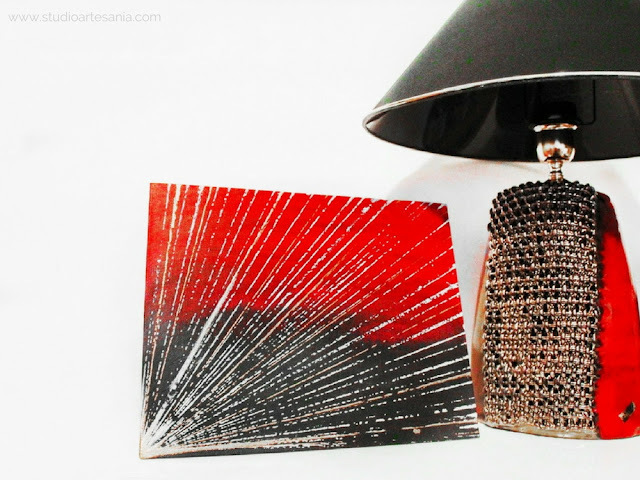 I choose a red and black combination with the touch of white and bronze so it will go well with the gorgeous handmade lamp Damir (my life partner) and I got as a present from his family members, but you can customize it in any color to suit your interior style. 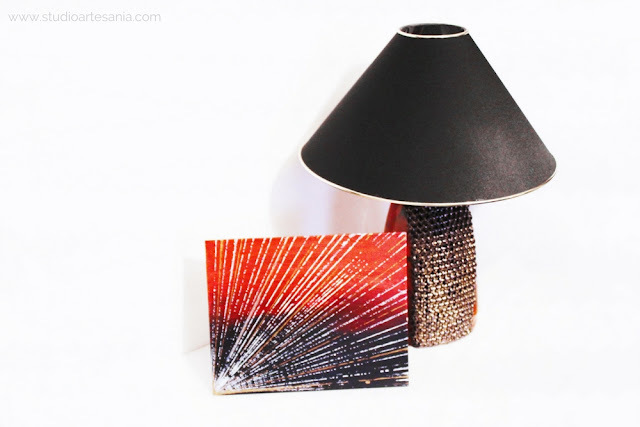 The final result will add a vibrant and textured pop to your home. So, here it is, a messy painting tutorial. 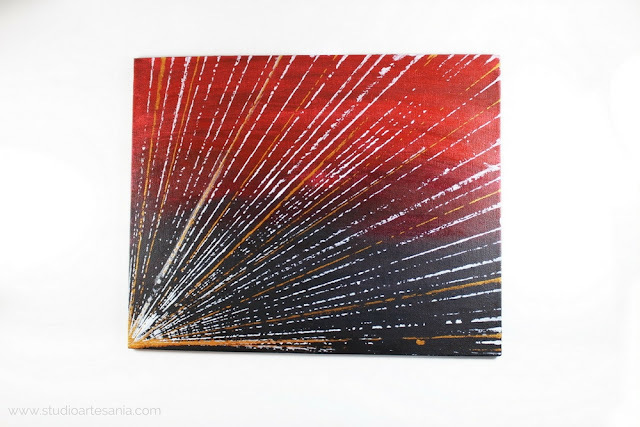 For this painting, you can use regular stretched canvas or canvas panel. I choose canvas panel in dimensions 24x30 cm (9.4x11.8 inches) because it best suits my needs. 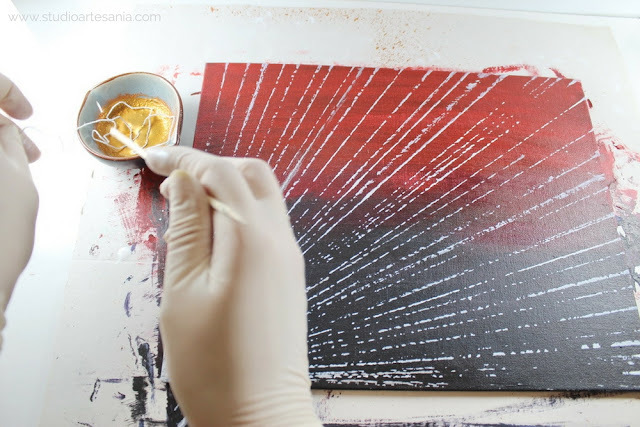 Making of this painting is a really messy job, so protect your work surface with the cardboard or thicker layer of newspaper. 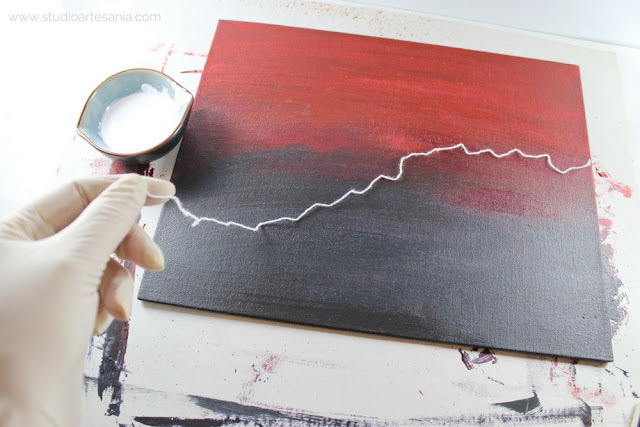 Directly from the tube squeeze out the red acrylic paint in the upper part of the canvas. Do not overdo it with the amount of paint, but again you have to put enough of it to cover the upper part of the canvas. You need to work on the filing because the amount of paint depends on the size of your canvas and on the effect you want to archive. Under the red, put a line of the fuchsia, then in the middle squeeze dark blue, and on the lower end of the canvas apply the black paint. 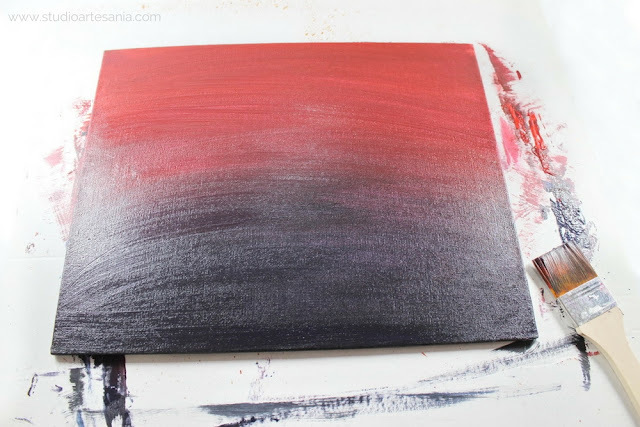 I used fuchsia and dark blue in the mixture to get a certain shade of red and black, but you can use only plain black and red paint. 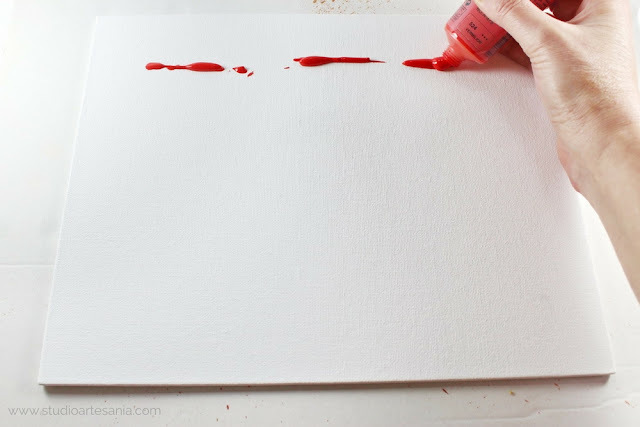 Smear the red paint on canvas by pulling the dry brush in left and right directions until you cover the upper part of the canvas. 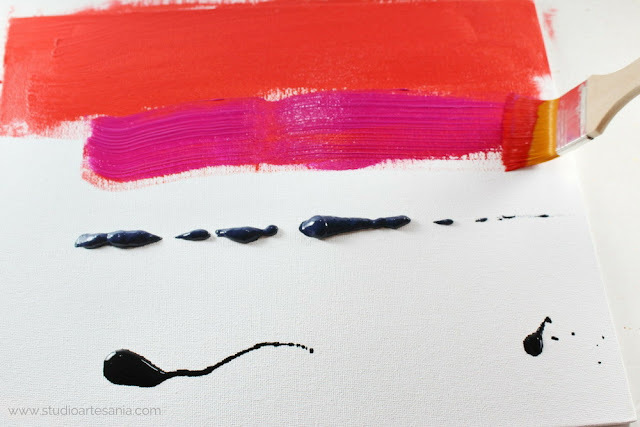 Then do the same with fuchsia allowing the paints to blend with one another on the joint. 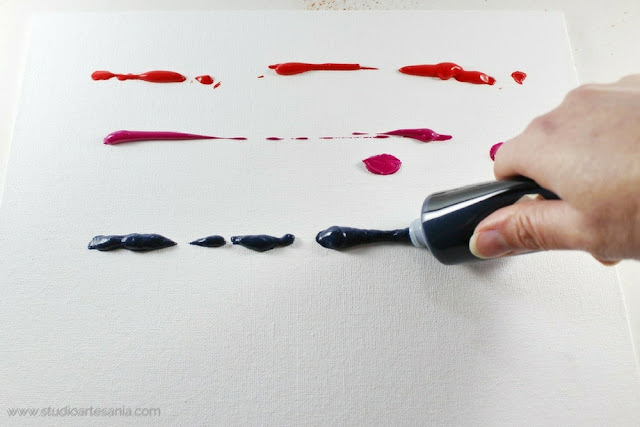 Continue to smear and blend all the paints in order to cover the whole canvas with colors. 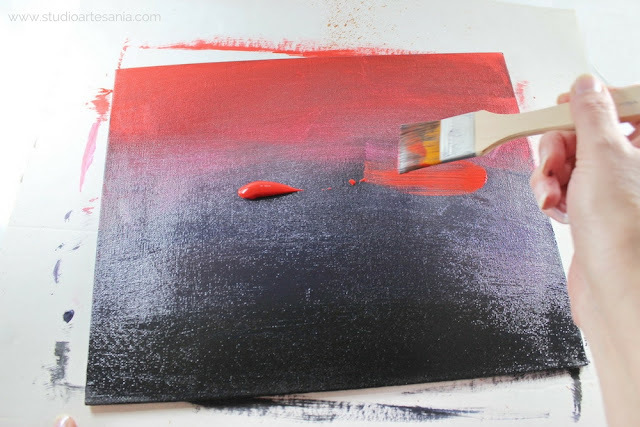 Do not forget to cover the edges of the canvas with the paint. You do not have to wipe the brush when switching to another color of paint because the mixing will be more effective. 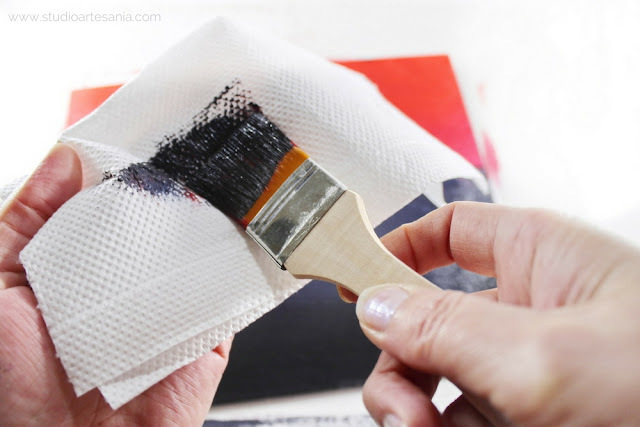 But, from time to time you'll notice that the brush has picked up a lot of paints, and then wipe it with paper towels to remove excess paint. If necessary, add more paints on desired spots. 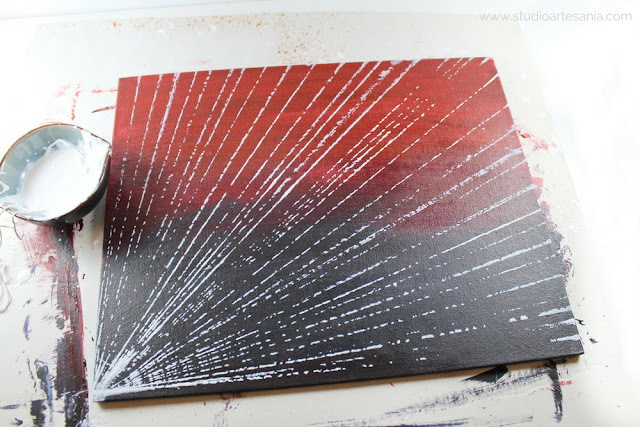 In my case, red was not noticeable as I wanted, so I added a bit more red paint in the middle of the canvas. 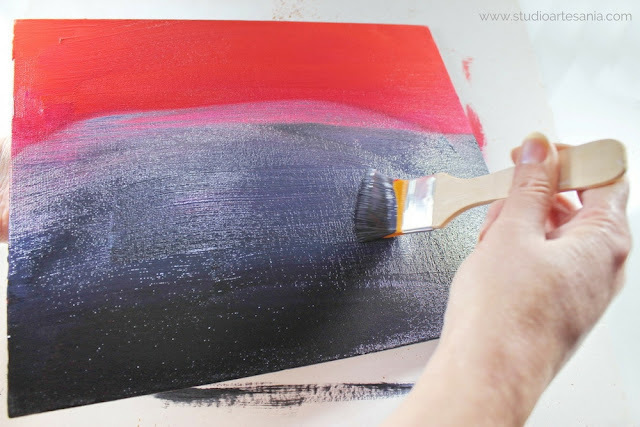 Blend the additional paint by pulling the brush in the left and right directions. 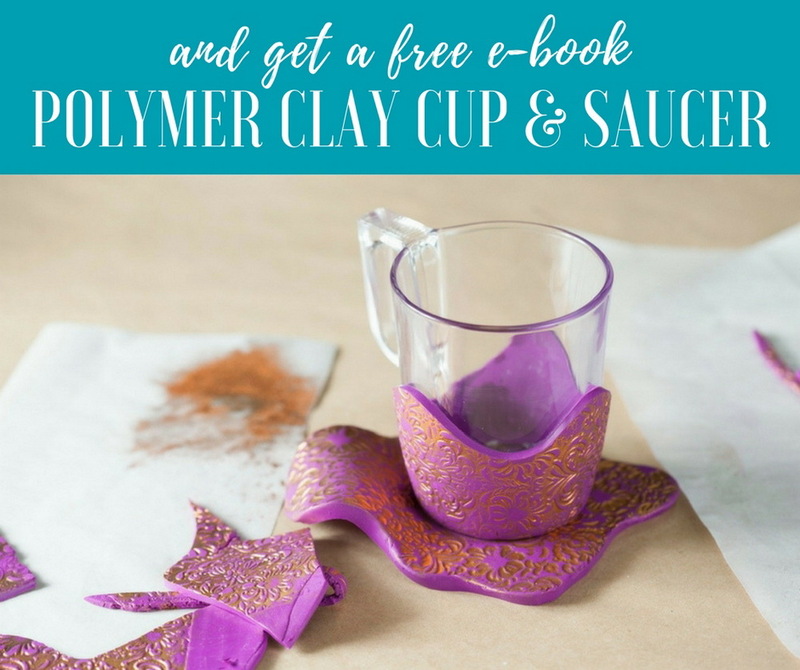 Leave the canvas on the side so the paint can dry. Acrylic paint is dried quickly, but to be completely sure that paint is dry since we use thicker coating, it is best to leave the canvas on the side for several hours. Do not forget to wash your brush. 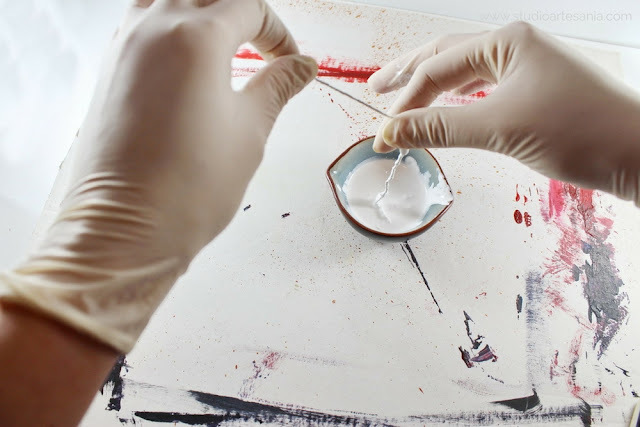 Squeeze white paint to the shallow bowl, and add the same amount of the water. 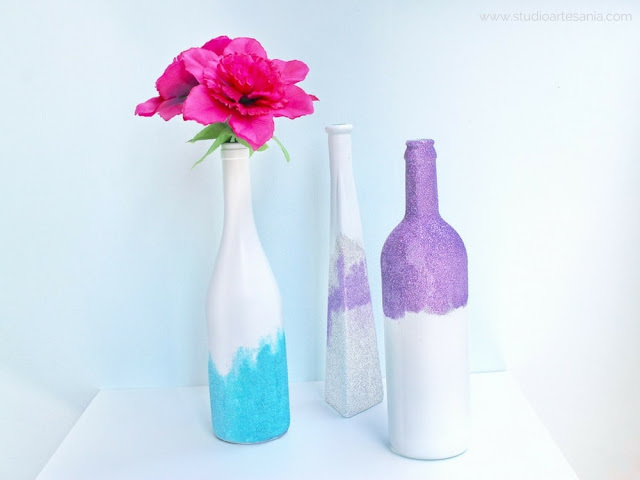 Mix well water and white paint until you get uniform, medium-diluted mixture. Cut a thread long enough to diagonally cross over the entire canvas. 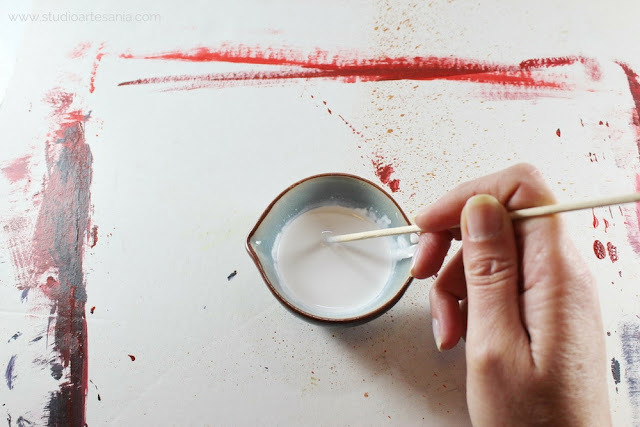 Dip the thread in the paint mixture, so it gets wet and soaks the paint. It takes few seconds for that. 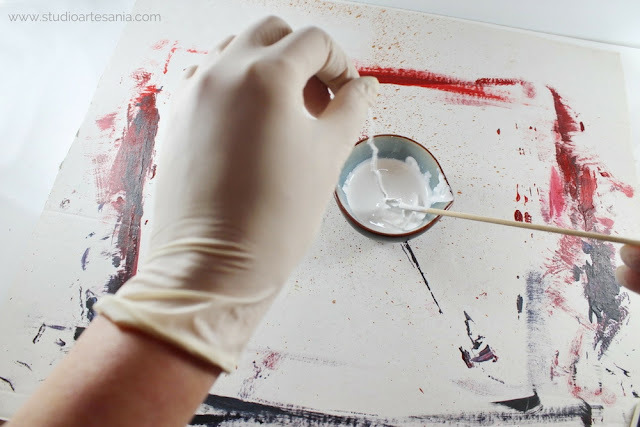 By pulling the thread between the fingers remove the excess of paint mixture. Tighten the thread and press it diagonally on the canvas. The starting point is the lower left corner of the canvas. Keeping the one end of the string on the starting point lift the thread, move it slightly to the side and press it again on the canvas. 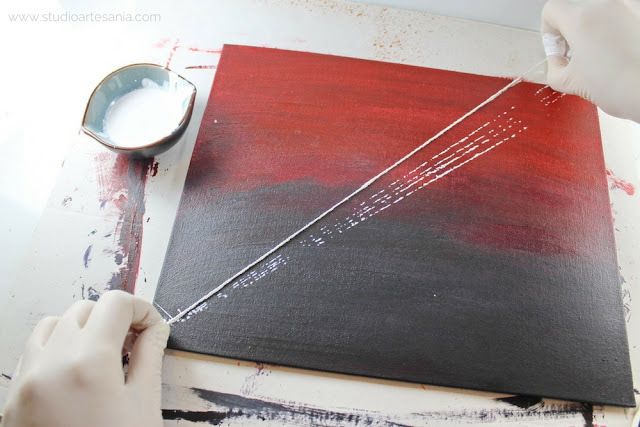 The string will leave behind a white line on the canvas. 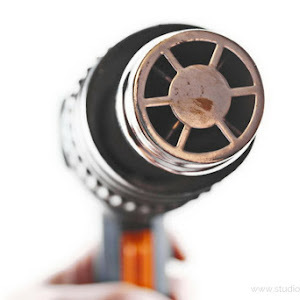 With a single coat of paint on the thread, you can apply about 4 to 5 lines. 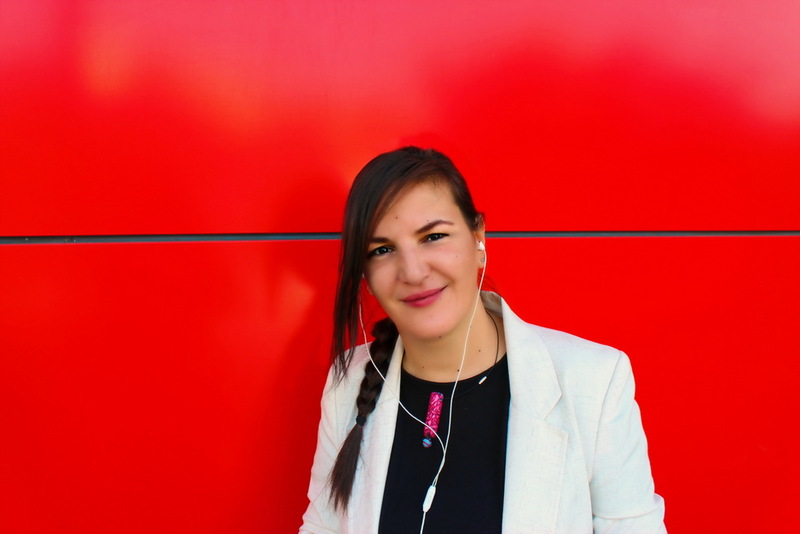 The lines can be discontinuous, but do not worry about that because it just gave the painting that something special. Continue to dip the tread as described in step 11 and 12 and leaving the white lines on the canvas until you cover the space according to your desire. But, keep in mind that starting point for every line is in the lower left corner of the canvas. 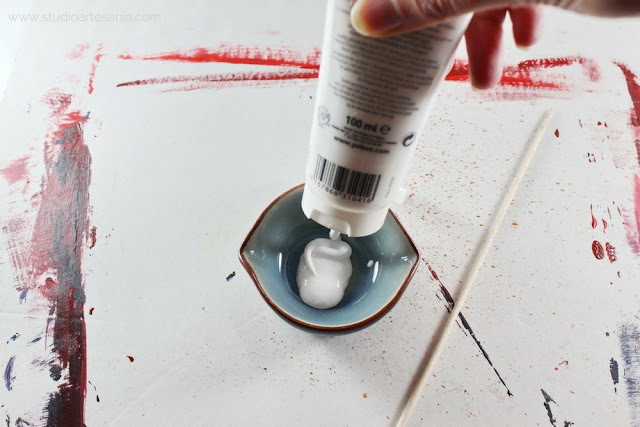 After you finish applying the white paint, clean and dry the bowl and the tread. In the shallow bowl mix the bronze mica powder with the varnish. Detail description how to make this mixture you will find in the Striped golden and white heart tutorial, so use it as a reference. 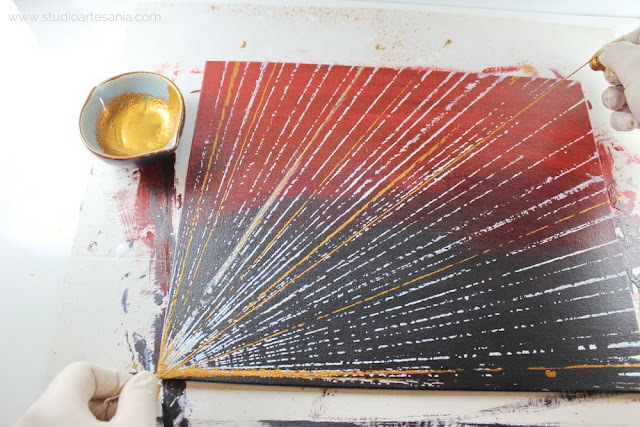 For this step, you can use bronze acrylic paint if you want, but I wanted striking metallic effect on my painting, so I choose this mixture instead. Dip the thread in the bronze mixture and pull it between the fingers to remove the excess. Make few bronze lines on the canvas. Again, the starting point is a lower left corner of the canvas. You do not want to overdo it with bronze lines, but only to emphasize the white lines with the few bronze ones. You can place the bronze lines between or across the white ones. I did both options. 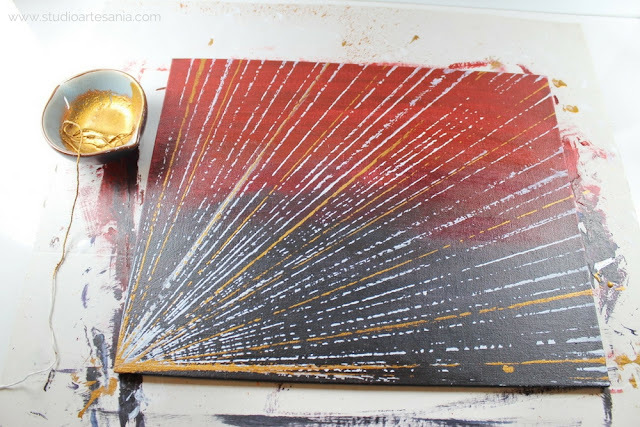 When you finish applying the bronze lines set the canvas aside to dry for 20 to 30 minutes. Clean the bowl and the treat. That's it! You're painting is finished and ready to amaze everybody who sees it. 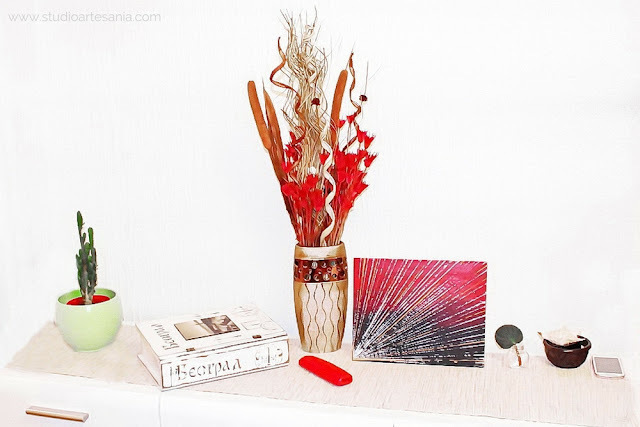 To display your art piece you can hang it or lean it against the wall. If you use canvas panel you can make a holder on the back of it, like I did, and place it wherever you want. Occasionally you can turn the painting in oposite direction and that way get a completaly different art piece.